20mph zones on their way? | What Car? 20mph zones on their way? The Government is planning to introduce 20mph zones into urban areas, using average speed cameras to monitor them. The proposal is part of new road safety legislation intended to cut road deaths by a third over the next decade. 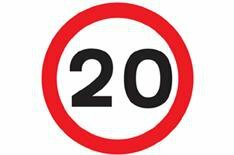 Variable speed limits will be introduced on main roads near schools, with digital signs instructing drivers to reduce their speed. A consultation document on the new road safety strategy will be published before the end of the year, which will set out tough measures and specific targets for reducing road deaths. Along with the widespread 20mph restrictions in town, a lower drink-drive limit is also being proposed in the Government dossier, along with six penalty points for severely breaking the speed limit and for not wearing seatbelts.